Every beginner runner wants to know how to run faster. Once you’ve got past the first stage of being able to keep running for longer periods of time without needing to stop, then your mind will naturally want to know how to run faster. It’s important that you build up a good foundation of fitness first, by walking initially and adding small amounts of gentle running in between before attempting to run faster. Because starting off easily and building up slowly is probably the easiest way to start running a little quicker. Use a stopwatch to time all of your runs. Start doing this now by recording every run you do this week including the route and the time it takes you to complete. Next week your aim will be to beat each of this week’s times. Not by much, just a little faster. Write down a plan of action. On this plan you must show a constant and steady progression of the speed of runs that you do. Writing down your goals and projected times like this will help you to subconsciously run faster. So for example let’s say that one of your runs takes you 20 minutes to complete. On your plan you write down 20 minutes as your week 1 time, then on week 2 you write 19.45, then week 3 – 19.30 and so on. Be sure to make your progressions realistic. You know how hard you run and how much faster you think you could go. Listen to some uplifting music. Something that lifts your emotions when you hear it. That way whenever you start to slow down, the next track you hear will give you another boost and help you to increase your speed again. Run with someone that’s faster than you. You don’t want an Olympic medallist pushing you along, just someone that’s a little quicker than you. By running alongside them, your pace will naturally increase to keep up. Top up your fuel tank. A couple of hours before you run, eat a meal full of carbohydrates. Things such as rice, pasta, sweet potato/potato and grains are perfect for this job. Have plenty so you feel full as this will ensure that your energy stores are as full as they can be. Be warned you must allow enough time for these foods to be fully digested which normally takes around 2 hours if it’s a carbohydrate based meal. So there you have it my top 5 tips for how to run faster. Using a combination of these will give the best results, but use any and you’ll start to see an increase in your speed. If you’d like to learn more advanced techniques to increase your speed, then ‘How to Start Running' is a perfect choice. It’s a running guide for beginner runners who want to improve their performance and follow a ‘proven’ road map to success. 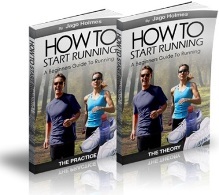 Click here to find out more – Running for Beginners.